We were out hiking not too long ago and had the fortunate experience to meet a man who used to be a white water river rafting guide on the Colorado river. He is now retired. However he used to take tourists rafting in Colorado on the Colorado river. This was in the Grand Canyon area of Arizona and Nevada. They would go on one week as well as two week excursions. Camping every night and navigating the river during the day. They would stop along various scenic places for picture taking. He would explain the many natural formations that you see along the river. This guy was still really fit. He could hike the trails with no problem at all and he was approaching 70 years old! 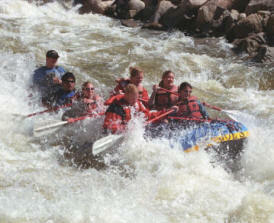 There were some pretty strong rapids to navigate as well providing thrills for the guide and his guests. He thoroughly enjoyed most of the time that he spent on the river and guiding people while rafting on the Colorado river. Apparently there were some not so good times as well. Once of the things we asked him was whether he ever had any accidents. Or if anyone ever dies while on some of these trips. His surprising answer was yes, several times which really surprised us. We asked him to explain how some of these accidents happened. What he would have to do when this happened. One of the problems is that some people would ignore the guides rules and common sense. They might have too much to drink. They would take chances that they might not have taken if they had not been drinking around camp at night. The river runs very cold due to the fact that the water comes from snow melt far up in the Colorado mountains. Anyone in the water for more than three or four minutes can end up with hypothermia. It also runs very fast. If you lose your footing, you are quickly swept away down river to either be dashed on rocks or suffer from hypothermia. Not a fun way to die. Even though these people were told what would happen, they would go swimming at night. They would experience hypothermia. Before they knew what was happening would be swept away by the very strong current to their death. Their bodies would be found some time later further along the river. Pay attention to what your guide is telling you when you go rafting on the Colorado river or any other river for that matter.